HEK-Blue™-hTLR4 cells were obtained by co-transfection of the human TLR4, MD-2 and CD14 co-receptor genes, and an inducible SEAP (secreted embryonic alkaline phosphatase) reporter gene into HEK293 cells. The SEAP reporter gene is placed under the control of an IL-12 p40 minimal promoter fused to five NF-κB and AP-1-binding sites. Stimulation with a TLR4 ligand activates NF-κB and AP-1 which induce the production of SEAP. 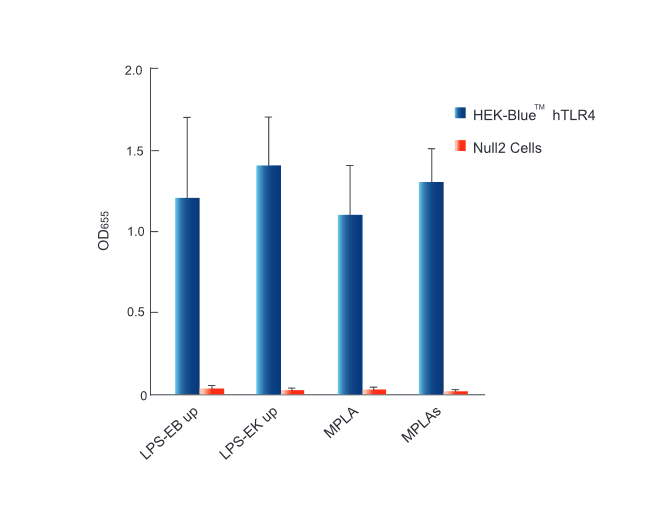 The parental cell line of HEK-Blue™ hTLR4 cells is HEK-Blue™ Null2 cells. 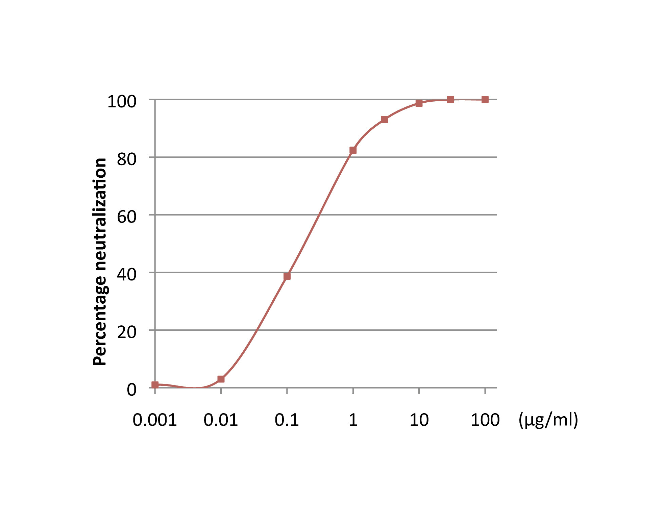 HEK-Blue™ hTLR4 cells were stimulated with various TLR and NOD agonists: Pam3CSK4 (100 ng/ml), Poly(I:C) (50 ng/ml), LPS-EB ultrapure (100 ng/ml), recombinant flagellin from S. typhimurium (10 ng/ml), CL264 (1 μg/ml), CL097 (3 μg/ml), ssRNA40/LyoVec™ (5 μg/ml), ODN 2006 (10 μg/ml), C12-iE-DAP (100 ng/ml ), L18-MDP (100 ng/ml ), and TNF-α (100 ng/ml ). After 18h incubation (24h incubation for CL264, C12-iE-DAP and L18-MDP ligands), NF-κB-induced SEAP activity was assessed using QUANTI-Blue™and by reading the OD at 655 nm. 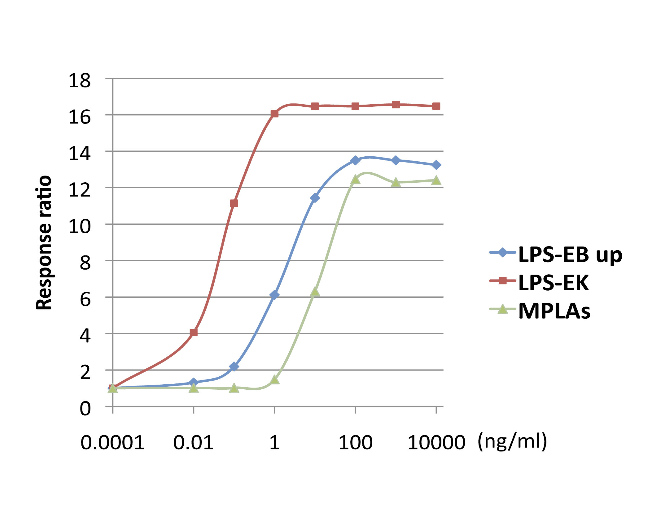 HEK-Blue™ hTLR4 and HEK-Blue™ Null2 (control) cells were incubated in HEK-Blue™ Detection medium and stimulated with 10 ng/ml LPS-EB ultrapure, 10 ng/ml LPS-EK ultrapure, 100 ng/ml MPLA or 100 ng/ml MPLAs. After 24h incubation, the levels of NF-κB-induced SEAP were determined by reading the OD at 655 nm. HEK-Blue™ hTLR4 cells were incubated in HEK-Blue™ Detection medium and stimulated with increasing concentrations of TLR4 agonists. After 24h incubation, the levels of NF-kB-induced SEAP were determined by reading the OD at 655 nm. The response ratio was calculated by dividing the OD at 655 nm for the treated cells by the OD at 655 nm for the untreated cells. 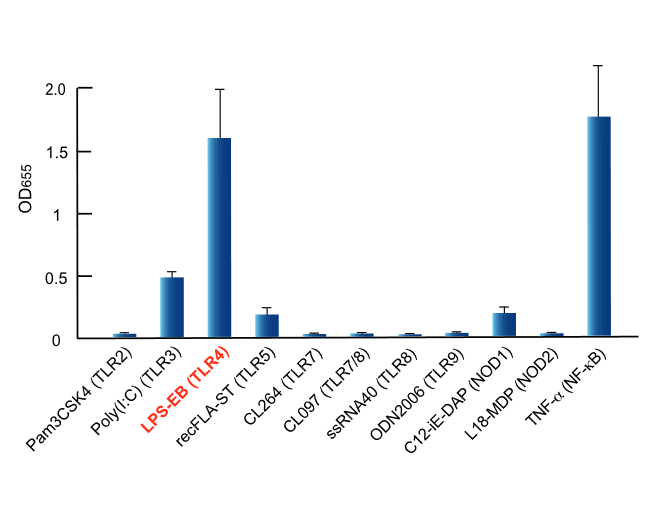 HEK-Blue™ TLR4 cells were pre-incubated for 1h with increasing concentrations of anti-hTLR4 IgA2, then stimulated with 5 ng/ml of LPS-EB Ultrapure for 18h. NF-kB-induced SEAP activity was assessed using QUANTI-Blue™ by reading the OD at 655 nm. Novel carboxylate-based glycolipids: TLR4 antagonism, MD-2 binding and self-assembly properties. Human inflammatory response of endotoxin affected by particulate matter-bound transition metals. Bradyrhizobium Lipid A: Immunological Properties and Molecular Basis of Its Binding to the Myeloid Differentiation Protein-2/Toll-Like Receptor 4 Complex. Sensing of Escherichia coli and LPS by mammary epithelial cells is modulated by O-antigen chain and CD14. Intravesicular Acidification Regulates Lipopolysaccharide Inflammation and Tolerance through TLR4 Trafficking. Inhibitory effects of dynorphin 3-14 on the lipopolysaccharide-induced toll-like receptor 4 signalling pathway. Toll-like receptor 4 mediates Lewis lung carcinoma-induced muscle wasting via coordinate activation of protein degradation pathways. 2017 J Allergy Clin Immunol. S0091-6749(17)30678-4. A human monocytic NF-κB fluorescent reporter cell line for detection of microbial contaminants in biological samples. Differential Activation of Innate Immune Pathways by Distinct Islet Amyloid Polypeptide (IAPP) Aggregates. T(H)17 cells promote microbial killing and innate immune sensing of DNA via interleukin 26. Meller S, Di Domizio J, Voo KS, Friedrich HC, Chamilos G, Ganguly D, Conrad C, Gregorio J, Le Roy D, Roger T, Ladbury J, Homey B, Watowich S, Modlin RL, Kontoyiannis DP, Liu YJ, Arold ST, Gilliet M.
Steady-state antigen scavenging, cross-presentation, and CD8+ T cell priming: a new role for lymphatic endothelial cells. Hirosue S, Vokali E, Raghavan VR, Rincon-Restrepo M, Lund AW, Corthésy-Henrioud P, Capotosti F, Halin Winter C, Hugues S, Swartz MA. Amino acid addition to Vibrio cholerae LPS establishes a link between surface remodeling in Gram-positive and Gram-negative bacteria.